Infrared proximity sensors are very fun to play with. In the past we have used them to make Digital Theremins and Control Robots, always using its proximity sensing (how far away an object is from the sensor) as the main feature. Today, we're going on a quest to use an infrared proximity sensor, to control the speed of a DC motor. In this article, we will go step-by-step through the process of understanding, designing and building a system that uses an infrared proximity sensor for input, correlates that input to how far away an object is from the sensor and then drives a motor and some LEDs at distinct speeds depending upon the proximity of the object. The goal of this project and article is to explain how to use an infrared proximity sensor to drive a motor. The system should be able to drive the motor at 8 different speeds (1 = slowest, 8 = fastest), likewise a representative LED bar will be added to give a second visual speed indicator. Up to 8 LEDs will be controlled to represent the 8 different levels of speed. 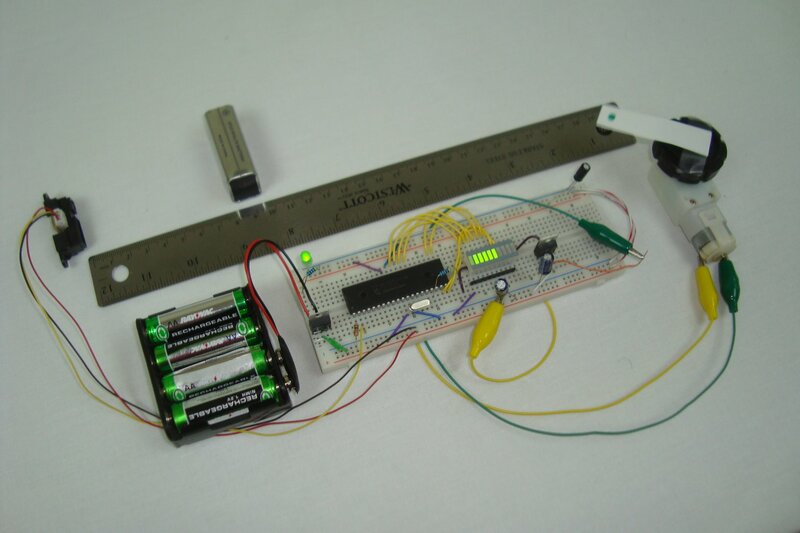 To make this system we will use a sharp ir distance sensor (10cm-80cm) for detecting how far away the object is, a PIC 18F4520 microcontroller to interpret the input and drive the output, a 10 LED Bar for giving a visual indication of what speed we're at, and a TIP42 + DC motor for the actual motor and power transistor to drive the motor.